Delighted to welcome Neil White to the blog today. Neil is the author of From the Shadows, a new series. I’ve read Neil’s The Domino Killer, and Neil has been a guest here before talking about plotting his novels, and here he is again! Thinking of a new series is always hard. It’s more than just thinking of a plot. There are characters and back-story and setting, all to get right from the start if the characters are to be repeated. From The Shadows is a new series for me, my third series. The fundamental thing for me in writing a series is that there should a pair of principal characters. No lone heroes for me, and all of my books have been like this, other than my standalone Beyond Evil. This reliance on pairings began with my second novel, Lost Souls. My first novel, Fallen Idols, had involved two main characters, a crime reporter called Jack Garrett and a detective called Laura McGanity. They were in a relationship but came into conflict in their working lives, as Jack wanted to know about her cases, and Laura wanted to keep him away from her cases. My initial intention was to create a community of characters, and in my follow-up novel, Lost Souls, I was going to make a defence lawyer the focus, with Jack and Laura as peripheral figures. As I wrote it, however, I found myself wanting to put Jack and Laura into it more, and it evolved into a novel where the lawyer became the background figure and Jack and Laura became the focus. It was when I realised why that the Jack and Laura series developed, and the series after that, as well as the series that begins with From The Shadows. It was about conflict, the push and the pull between the characters. The two strands kept bouncing the reader back and forth, pushing the story onwards, and created conflict between the main characters. From that second novel, I knew that I would always prefer pairings to solo heroes. Not that the classic solo characters don’t have sidekicks. Jack Reacher roams alone, but he always picks up a helper along the way. Holmes had Watson. Morse had Lewis. Those were sidekicks though. I’ve always seen mine as equal partners. When the Jack and Laura series ended after five books, my choice, and a standalone, I embarked on another pairing: the Parker brothers series. Set in Manchester, it involved two brothers, one a defence lawyer, the other a detective. As with Jack and Laura, there was an in-built conflict, the push and the pull, both on opposite sides of the criminal justice fence. I ended the series after three books and turned it into a trilogy because I wanted to write a new series. It’s not that I have a low boredom threshold, but more that I don’t want to keep on with something past its natural expiry date. What changed everything was the launch of BonnierZaffre, a new publishing imprint that I wanted to be involved with. I liked the people behind it, I liked the authors they were recruiting, and I wanted to be part of it. It set off to a hungry start though. I met the big guns of BonnierZaffre for the first time at a Chinese restaurant in London, a favourite of my wonderful agent, Sonia Land. They were adept with chopsticks. I was a beginner. They gleefully tucked into the stream of food landing in straw baskets, all of it confidently making its way to their plates, whereas I wobbled the food my way like I was balancing jelly on a knife-edge. I told them of my idea and watched them eat, and occasionally retrieved more food. They liked what I had to say and a fabulous new relationship began. They left, stuffed and contented. I left excited and happy, but immediately detoured to a kebab shop, still hungry. The series will focus on a defence lawyer, Dan Grant, and a private investigator, Jayne Brett. The hook between them is that Jayne was once Dan’s client, accused and acquitted of murdering her abusive boyfriend. Jayne has strong feelings for Dan, but can’t express it, because the last person she loved ended up dead, the knife in her hand. Dan has strong feelings for Jayne, but she’s a former client and he won’t cross that line. The setting was important for me. I wanted to make them legal in nature, much more so than my previous books. After all, I’ve been a criminal lawyer for more than twenty years, so why not use. I wanted to set the books in the north of England, but in a smaller town than the Parker brothers books. My feeling about that was that there’d been plenty of legal thrillers set in the big cities, but not so many in the small towns. There have always been plenty of police procedurals set in small northern towns, but rarely legal ones. Here we are, two years on from that Chinese restaurant and the first book is out, From The Shadows. I hope you like it. I enjoyed writing it, and it felt like an exciting new chapter. The second is nearly finished and will be due out next year, and I can’t wait to start the third. Thanks Neil – the new series sounds fantastic – can’t wait to read it! 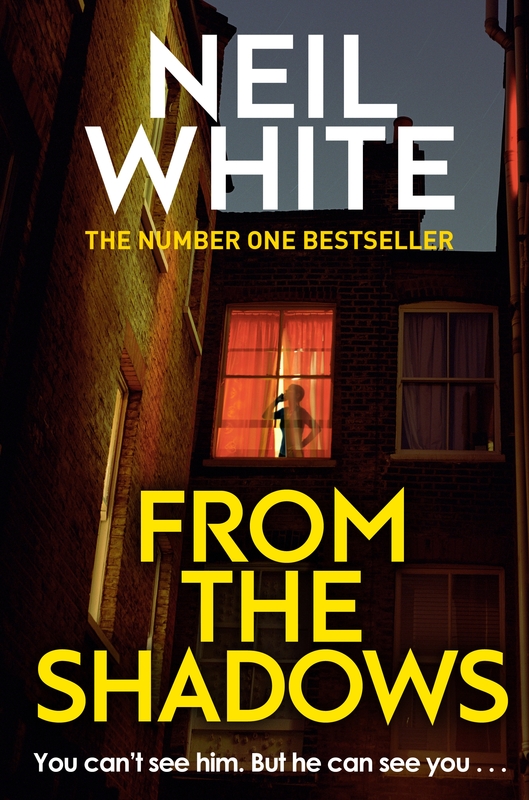 From the Shadows by Neil White is published by Bonnier Zaffre and is out now in ebook. You can find Neil on twitter @NeilWhite1965. He hides in the shadows, watching, waiting, until the time is right . . .
Mary Kendricks, a smart, pretty, twenty-four-year-old teacher, has been brutally murdered and Robert Carter is accused of killing her. When defence lawyer, Dan Grant inherits Carter’s case only weeks before the trial starts, everyone expects him just to babysit it, but Dan’s not that kind of lawyer. He’ll follow the evidence – wherever it takes him. But as Dan and his investigator Jayne Brett look into the case, they discover that there is more to it than meets the eye. In order to do their jobs they need to push the limits of the system, even if it means putting themselves in danger.